If you believe everything you read in the financial media, Amazon is the destroyer of worlds. Well, maybe not “worlds,” but entire sectors of the market at the very least. For example, years ago when Amazon ramped up spending on its online streaming video service, Amazon Prime Video was going to topple Netflix from the top streaming spot. Netflix stock took a serious hit from the media deluge, but Netflix subscriber numbers never wavered. In fact, the two continue to coexist, with Netflix gaining a considerable upper hand in overseas growth. The same thing happened last year, when Amazon bought Whole Foods. Amazon was going to destroy the grocery market by combining brick-and-mortar stores with online ordering and delivery. Stock in Kroger, the nation’s largest grocery store outside of Walmart, plunged on the ensuing barrage of doomsday media headlines. My colleague Jeff Yastine called this one. “Where’s the incredibly low prices Amazon promised?” Jeff quipped back in December. The fact is, the integration of Whole Foods hasn’t gone as smoothly as many had hoped. While Amazon is still making headway in the grocery market, Kroger stock has come roaring back and is now trading at pre-plunge levels. You can already see where this is going. This week, Amazon announced a partnership with Berkshire Hathaway and JPMorgan to cut health costs and improve services for employees. As with online streaming and grocery sales, Amazon was once again going to “destroy” another market sector, and health care industry stocks were slammed as a result. If the history of such market reactions has taught me anything, it’s that now is a great time to buy stocks in the health care sector. Kroger stock is up more than 47% since the Whole Foods buyout, Walmart stock didn’t even blink an eye at the news and Netflix stock continues to hit new all-time highs … just to name a few. The question is which health care industry stocks to buy. A good starting point, if you’re unsure about health care stocks, is a broad sector exchange-traded fund (ETF). 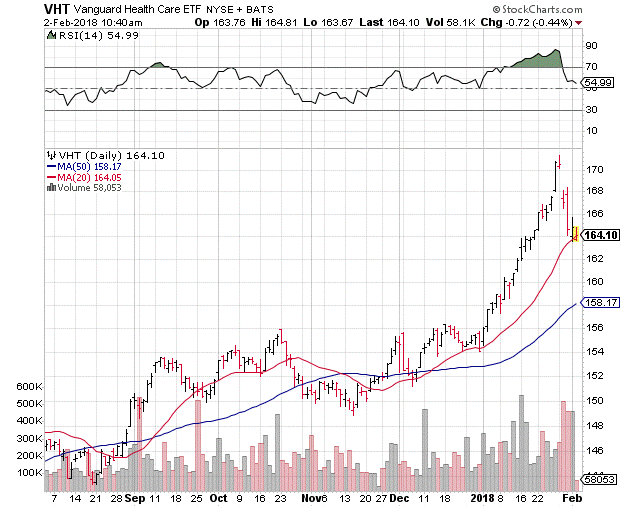 The Vanguard Health Care ETF (NYSE: VHT) gets an A+ expenses rating from ETFdb.com. Furthermore, the ETF’s price action has been impressive over the past year, gaining more than 16%. The short-term outlook is even better. Until the Amazon announcement, VHT was on an impressive run higher, topping out at multiyear highs north of $170. The post-Amazon plunge is actually a blessing for those who want to get in now. VHT is now trading well below overbought levels, and the shares are perched on support from their 20-day moving average. That said, there could be a little short-term weakness in the next few days due to broad-market volatility. However, VHT is sure to rebound solidly once the Amazon news finally wears off. 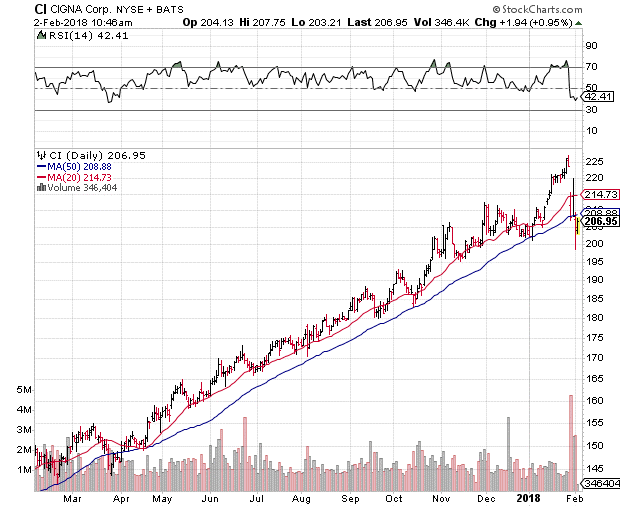 For a more specific recommendation within the group, I rather like Cigna Corp. (NYSE: CI) for long-term gains. CI stock’s knee-jerk reaction to the Amazon news pushed the shares from overbought levels to near oversold levels in a matter of days. However, the shares held firm at support near $200, and Cigna stock is on the verge of reclaiming its 50-day moving average in short order. Cigna also just reported strong fourth-quarter earnings growth, 6% year over year, and projected solid guidance for fiscal 2018. What’s more, Cigna CEO David Cordani said he believes the Amazon partnership will be a benefit to the company, not a hindrance. Cigna has been moving away from the “fee-for-service” model that dominates the health care industry. Fee-for-service bases payments on volume of care rather than quality, and it’s one of the main points the Amazon partnership is trying to address. On a final note, there are clear losers from this new Amazon partnership. Specifically, companies like Express Scripts and CVS Health that deal mainly in filling prescriptions. With Amazon clearly making a move toward mail-to-order prescriptions, it’s going to quickly erode these companies’ bottom lines. Editor’s Note: You can sign up to get “freedom checks” today regardless of your age, income or which state you live in. All you have to do is decide how many of these freedom checks you want, stake your claim in the massive payout of up to $34.6 billion … then sit back and watch the cash pile up. Many people just like you have already made out like bandits using this new program! To find out how to start collecting your freedom checks as soon as possible, click here now.